We have elucidated some amazing results from the Special Relavity (SR) postulates and more stuff is to come. Indeed, the own structure of Lorentz transformations is hinting some hidden symmetry between the concepts of space and time that are seen as independent from each other in Classical Mechanics. Einstein’s work on the principle of relativity and the electrodynamics of moving objects was showinga new symmetry of Nature, and it was pointed out by the old known Maxwell’s equations. Nobody realized it until Einstein’s papers were published. Herman Minkowski was a professor of A. Einstein in Zurich. He was surprised by the fact Einstein were so deep in the problem of Electrodynamics. Then, Minkovski himself did a new advance on Einstein’s relativity and exposed his own works in 1908. Minkowski suggested that relativity meant that space and time are no longer independent entities, as in fact the Lorentz transformations show. Lorentz transformations mix space and time coordinates. Relativity was saying, according to Einstein, that space and time as absolute entities did not exist. Minkowski was a step further and suggested that relativity is just geometry of space and time merged together, a.k.a., that Lorentz transformations and relativity were… Physics in spacetime! Physics processes are then labelled by coordinates in “space” and “time”, or in “spacetime” for short. SR is just a set of rules or geometry handling with transformation between differente events in spacetime. Events in spacetime are labelled by some set of coordinates of space and time. If we restrict to the commonly known 3 dimensions of space and the single dimension of time we seem to observe, Minkowski exposed some mathematical framework to work in a 4-dimensional (D=3+1) spacetime. His tools can indeed be generalized to any arbitrary spacetime with D-dimension as well, but we will no go further in that direction today. We will only discuss 4D spacetime in this post. Question: if time and space are relative, as Einstein suggested,…Does it mean that we have nothing “invariant” to study? Geometry in Minkowskian spacetime is the answer it. Fortunately, mathematicians in the 19th century had studied non-euclidean geometries and it was just rediscovered by Minkowski that non-euclidean geometries could fit the new theory of relativity. The Minkovski spacetime was very helpful in the building of the relativistic theory of gravitation, a.k.a., general relativity in spite Einstein himself put critics on the spacetime formalism. Soon, he changed his view and he learned the Minkowki spacetime stuff. If the S-frame and the S’-frame are related by Lorentz transformations, the invariant is the same. That is the key of spacetime! The invariant is called proper time, i.e., the time measured on the clock travelling attached to the reference frame, or, equivalently, the time measured by an observer in motion with the frame. Any other frame will not be “invariant” and it has to be Lorentz transformed in order to agree on clock measurements with any other observer in other different frame. Please, note that, the speed of light is invariant as it should, accordingly to the SR postulates. 1) The use of spacetime vectors. In the case of a D=4=3+1 spacetime, spacetime vectors are called 4-vectors and they represent events in the continuum spacetime geometry. This hyperbolic non-euclidean geometry was indeed studied by Gauss, Lobachevski and other bright mathematicians during the 19th century. The use of these vectors simplifies long calculations. 2) The use of Minkowski diagrams. Minkowski suggested that the causal structure of the geometrical spacetime was given by the structure of the “light-cones”. In , two hyperboloids can intersect in one point and it settles the physical events. The use of Minkowski diagrams is intuitive and it helps to visualize and solve physical problems too. 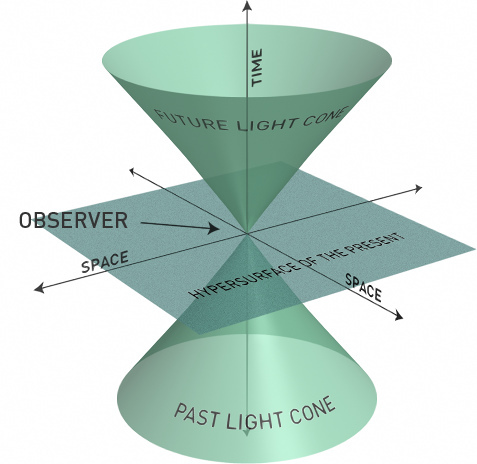 You can see a light-cone in Minkowski space above, fixing the causal structure of spacetime.